Welcome to the tenth episode of Kidmin Talk, the webcast show hosted by Karl Bastian, the Kidologist. Listen here on Kidology or subscribe via iTunes to listen on-the-go with your iPhone, iPod, iPad, or other mobile device. Download a PDF my workshop: Leading Kids to Christ (PDF 4.2 MB) for complete notes. KIDMIN WINNER! Our winners this week for guessin that the letter "G" stood for "Gospel" are Stephen Hicks, Scott Phillips, and Barney Kinard. 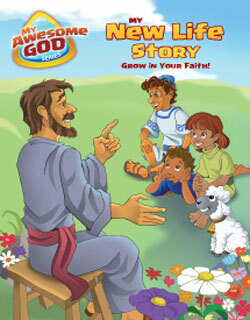 I'll be mailing them several copies of DiscipleLand's My New Life Story and Awesome Adventure! How it is time to guess what the Kidmin Keyword for the letter "H" should stand for in the nex show! YOU could be a winner next! WANT TO BE A WINNER? Submit your guess or suggestion for next week's Kidmin Talk Key Word for the letter "H" - by E-mail, Forum, or Twitter.